Black Arrow -- Fires a Black Arrow at the target doing damage over time. Momentum --When any of your attacks cause a critical striked there is a chance the cooldown of disengage will be reduced by 10%. True Aim -- For every successive Arcane, Marked or Aimed Shot used to attack the same target, those shots deal 2% more damage to the target, stacking up to 20 times, can only affect one target at a time. Delirium's Note: I really don't like this talent. While the top hunters in the world will of course sacrifice their own DPS to benefit their raid, most will not. Talents and our rotation in general should reward us for playing well, not for tunneling on the boss the whole fight. Camouflage -- You blend into the surroundings and gain stealth for 1 minute. While camouflaged, you will heal for 2% every 1 seconds. The first ranged attack dealt while camouflaged will deal 10% extra damage. Piercing Shots -- Your critical strikes with Arcane Shot, Marked Shot and Aimed Shot cause the target to bleed for an additional 30% of the initial damage over 8 seconds. Broadside -- Aimed Shot will now also hit all Vulnerable targets for 100% physical damage. Light 'Em Up -- Targets affected by your Flare take extra damage from all of your attacks. Steady Focus -- Using Arcane Shot twice in a row increases your Focus Regeneration by 50% for 10 seconds. Head Shot -- A powerful shot which deals physical damage to the target and all a 25% as much damage to all enemies between you and the target. Dark Ranger -- Your ranged attacks and attacks that deal damage over time now have a chance to summon a Dark Minion. The Dark Minion will attack your current target. Kill Flip -- For 8 seconds after Disengaging, you deal 50% more damage. Lock and Load -- Attach an explosive charge to Aimed Shot, dealing additional Fire damage to the target and all enemies within 4 yards. Your ranged auto attacks have a 5% chance to trigger lock and load, causing your next two Aimed Shots to cost no Focus and be instant. Arcane Shot -- A quick shot that causes 125% Arcane damage and generates 5 focus. Aimed Shot -- A powerful Aimed Shot that deals 435% physical damage. Cannot be cast while moving. Marked Shot -- Rapidly fires a shot at up to 3 targets affected by Hunter's Mark. Usable while moving. Also exposes Vulnerabilities in the target, snaring them by 15% and increasing Aimed Shot damage done to the target by 25%. Lasts 10 seconds and stacks up to 3 times. 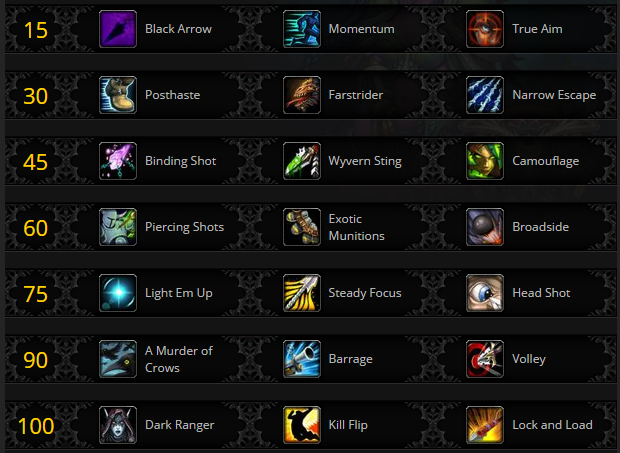 Seek Vulnerabilities -- Targets hit by your Arcane Shot and Multi-Shot have a chance to be marked with Hunter's Mark. Bursting Shot -- Fire an explosion of bolts that strikes all enemies in front of y ou, knocking them back and disorienting them, and dealing 40% physical damage. True Shot -- Increases Haste by 40%, and increases chance for targets to be marked by 100% for 15 seconds. MM hasn't really been viable for PvP in the last couple of seasons. 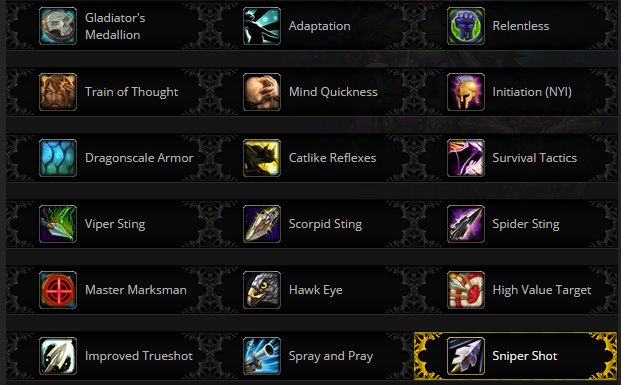 With the huge changes to how honor is working in legion, along with the revamping of the specs, so far, at least, MM is looking like a fun PvP spec, giving hunters and option for a very high risk, high reward playstyle. I'm really excited to take it into some BGs and Arenas, if I ever make it into the Legion Alpha/Beta. Master Marksman - Honor Level 8 -Your shots deal 20% increased damage to targets further than 30 yards away from you. Improved Trueshot - Honor Level 10 - Reduces the CD of Trueshot by 30 seconds, and restores 100% focus. Hawk Eye - Honor Level 25 - Increases the range of all your shots by 5 yards, and increases their damage by 5%. Spray and Pray - Honor Level 28 - Dealing damage with Bursting Shot now grants Bombardment. Bombardment now also reduces the GCD of Multi-Shot by .3 seconds. High Value Target - Honor Level 43 - Increases the Critical strike chance of your shots by 30% on targets with a higher maximum health than you. Sniper Shot - Honor Level 46 - Take a Sniper's stance, firing a well-aimed shot dealing 820% physical damage. Increases the range of all shots by 40% for 6 seconds.